This profile is different from the Personality Profile in that it compares or rates important traits in your chart in relationship to one another. Every individual has every possible trait present in his or her makeup to some degree. No one is entirely without musical talent or completely void of intuition. The Talent Profile looks at the ratio of a wide range of traits and compares them with similar traits. Each section of the Talent Profile stands on its own. In other words, don't compare the section "Your Artistic Side" with the section "Your Inner Self," but rather consider the traits within each section in relation to others in the same category. In our sample reading, you will notice John’s Artistic side seems to be more dominant than his Inner Self section. This, by itself, means little. What is more important is that his Artistic side appears to be dominated by verbal and inspirational creativity rather than musical talent. And that, while he is certainly creative (his creative bar is quite long) the bar denoting originality is relatively short. This suggests he will most likely be drawn to established methods and techniques rather than breaking new territory or venturing into the unknown. The Talent Profile requires your analytical, skeptical, and discriminative powers, so take your time with it. While this is a one-time report, chances are that each time you view it you will learn something new about yourself. This report matches your personality traits and talents to the vocations they are most suited to. It is designed to help you identify areas in which you are likely to succeed and find contentment. Knowing which attributes come naturally can inspire you to develop and build on those strengths. I began offering personal consultations in the early 1980’s and quickly learned that my clients’ main concerns were romance, health, money, and career. Of those, I realized the largest and most enduring obstacle to happiness tended to be their choice of profession. If a person is unable to find satisfaction in their work, there is little that can make up for the years spent in a state of discontent. This understanding prompted me to develop the Talent Report. By employing numerology’s unique analytical approach to decoding an individual’s personal makeup, I felt it could be used to help make informed career choices based on an objective understanding of one’s attributes. Each of the nine single-digit numbers has a specific range of personality traits. Most traits are found in more than one number, although in varying degrees of influence – some stronger, others weaker. Each number carries both positive and negative aspects, and displays those traits in a unique manner. For example, courage is found in the numbers 1, 2, 5, and 8. However, the way these numbers display courage differs considerably. The number 5 is the most courageous, but its bravery is impulsive and rebellious, the kind that stands up to a bully or the status quo regardless of the consequences. The courage of the number 1 is more focused; it is the daring leader, the first to cross a dangerous sea, climb a mountain, or fly to the moon. The number 2 displays a gentle and kind valor, as in the act of sacrificing oneself to save another. The courageous 8 is motivated by duty and authority; it confronts danger to protect the law or the land. Traits such as courage, that on the surface would seem to be constant no matter the circumstances, can actually be subtly different. Take the example of courage vs. thrill seeking; both require bravery, but the latter will look for opportunities to take unnecessary chances. Thrill seeking reflects an addiction to adrenaline, whereas pure courage is the act of overcoming one's fear. For your Talent Profile we looked at seventy-four traits, divided into eleven groups. The first group has to do with individuality, independence, and initiative. The second looks at traits that share creative and social aspects, and so forth. The profile also rates your aptitude in thirty-nine careers, grouped into seven fields. Keep in mind that numerology is an inexact science and looks at the relationship between character traits and vocations differently than psychological or vocational assessments. It is one tool among many that can shed light on finding the right career options for you. 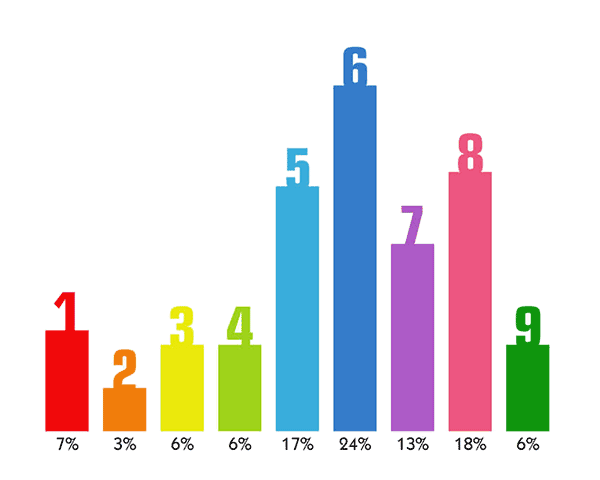 Your Proportional Chart lists each of the nine single-digit numbers and illustrates how strongly they are represented in your chart. This chart is based on an algorithm that selects your numbers, considers their location, and assigns a value that reveals which numbers have the most influence. For example, your Life Path number carries considerably more weight than your Hidden Passion. The influence of your Expression is greater than your Heart's Desire number, which in turn overshadows the influence of your Personality. However, carrying two or more of the same number increases its significance (and thus increases the value assigned to it). You may have heard that the most important aspect of your chart is your Life Path number. This is often true; however, whereas an astrology chart is largely built around your sun sign, a numerology chart centers around five core numbers, with the remaining numbers adding additional insight. Because each core number holds weight (although less than your Life Path number) it is not uncommon for a number other than your Life Path to be the most influential. If, for instance, you have a 6 Life Path, but three other core numbers are represented by 9, the 9 will be considered dominant in your Proportional Numerology Chart. This chapter looks at traits and talents, and how well they are represented in your chart. Keep in mind, we often mistake something we enjoy for something we do well; enthusiasm for something does not always translate into possessing a talent for it. Conversely, we may be quite skilled at something we don’t necessarily enjoy, perhaps as a result of a childhood experience or other influence. Also, the ability to recognize and act on a previously undiscovered talent may come later in life or after establishing a dissimilar career. Think of artists who found their gift only in their later years, the stockbroker who uses her wealth to establish a humanitarian foundation, or the accountant who became a nature guide. Enough of these attributes exist in your personality to make you a capable survivor and someone able to lead when needed. You can be decisive and you do not shrink from your duties, nor back away from confrontations. However, you are not as comfortable in such roles as you would like to be and you probably function better, and are happier, when there are others who support you and share in the responsibilities. A well-balanced rating in this category shows that while you have no trouble expressing yourself, and are not afraid to communicate deep, emotional issues, you are also capable of holding your tongue when called for. You do not betray confidences, but you are not exactly secretive, either. You probably tend to be a little self-conscious at social events, hanging back and observing when deep down you would rather interact with others. This rating suggests you are not particularly introverted, but neither do you let your guard down easily. You are a bit of a dreamer, but this does not prevent you from recognizing the difference between practical and unrealistic. A healthy balance between the impractical visionary and the practical doer helps you accept the world as it is, while enabling you to see the need to be involved. You may be attracted to politics or the law as a way to make the world a better place. You are not particularly demanding and as long as you have no overwhelming problems, you wake up happy and, more often than not, ready to enjoy your day. You make friends easily, enjoy social activities, and helping others comes naturally. This rating indicates you work well with others and tend to be a peacemaker and a stabilizing influence. Due to a tendency to avoid unnecessary confrontation, you may be prone to agree with others when, in fact, you don’t have the same opinion. You are conscious of the feelings and wellbeing of others and easily persuaded to help those who are less fortunate. You are naturally drawn to people from all walks of life. You are tolerant, conscientious, and generous. You find satisfaction knowing that your involvement makes a difference in the lives of others. You easily relate to the problems and needs of others, and attain satisfaction from helping. You likely have numerous friends and acquaintances that will be there for you in return. You are able to bring comfort and happiness to your partner due to your instinctive ability to say the right thing at the right time. You are loving and generous and inspire loyalty. However, you also have a need for privacy and time alone, and would do well with a life partner who doesn't rely solely on your companionship for happiness. The potential to meet your goals is substantial. You are capable of putting forth considerable effort. Your biggest challenge may be staying flexible. Be on guard about remaining in a career or situation strictly out of habit or an unfounded sense of responsibility. You may be less confident in your chances for success than you can and should be. You have the ability to reach almost any goal you set for yourself, particularly if discipline is highly rated in your chart (see above). Ambition without discipline equals frustration, so if it is not rated highly enough for your liking remember, although it comes more easily to some, discipline is a skill that can be learned. This chapter shows your natural aptitude for various types of professions. If you feel validated in the profession you are pursuing, congratulations. If you feel you are in the wrong line of work, consider what it would take to move toward something more satisfying. Others may have found their niche in an unexpected area, or made peace with a career that was not their ideal choice. Regardless, the listings below may shed light on areas of interest you have not previously considered for work, hobbies, or volunteering.